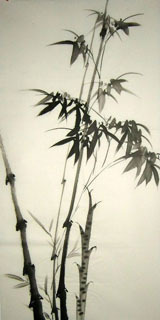 Bamboo, one of the plants linked most strongly with Chinese traditional culture. 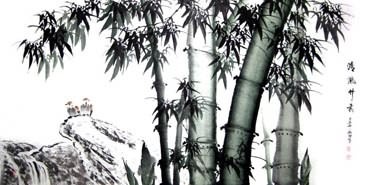 Down the ages, bamboo comes down to the basic necessities of Chinese nation's life. The ancients said: they would rather meat free than live without bamboo. That shows bamboo has a very close relationship with people's daily life. 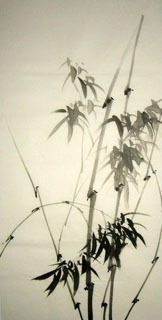 Just as Joseph Needham - British scholar said: East Asian civilization is bamboo culture. 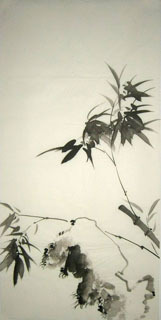 Chinese Bamboo Painting: The Chinese often compare bamboo to gentleman for its unique character of being neither cringing nor arrogant. 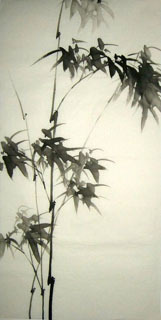 Furthermore, bamboo painting is symbolic of self-effacing, integrity, and safety. 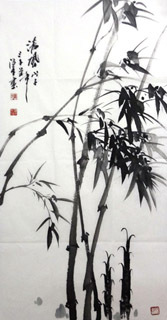 Chinese Bamboo Fengshui Painting: 节节高升. 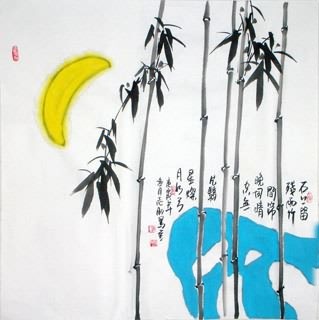 For the tall and straight bamboo and its joints, people also present bamboo painting to express good wishes of being promoted to a higher position or rank successively. 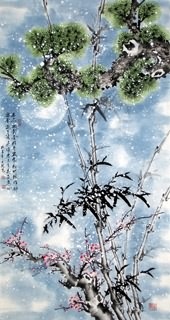 Chinese Pines, Plum Blossoms and Bamboo Painting: 岁寒三友. Plum blossom(blooming in the snow), pine(evergreen) and bamboo(never withering in the winter). They are three good friends resisting cold weather together. 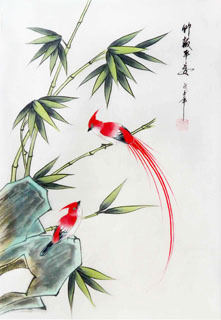 Chinese ancient scholars often used these "three friends" to express the noble characters of strength, purity, resilience, and the ability to overcome adversity, while the folk people regarded their characters of evergreen and never withering in the winter as an auspicious symbol of the exuberant vitality. 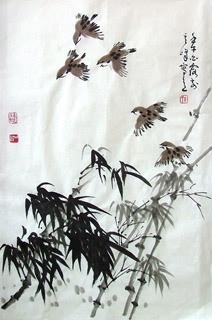 Chinese Fengshui Bamboo, Plum blossoms and Two Magpies Painting: 竹梅双喜. 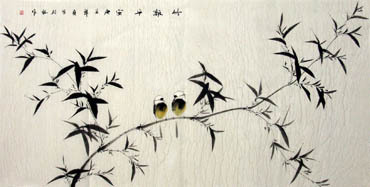 The association of happiness at hte coming of sring with the plum blossoms, bamboo, and two magpies, becoming a popular coupling symbolizing double happiness. 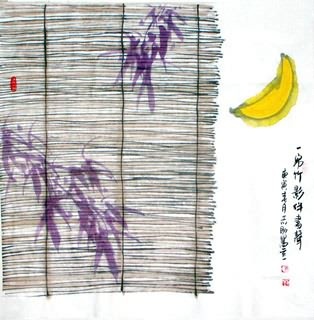 When bamboo and plum tree are depicted togehter, the message means a friendship formed in childhood -- said of boys and girls. The two magpies representing they tie the knot and their marriage fill with all the good thing. 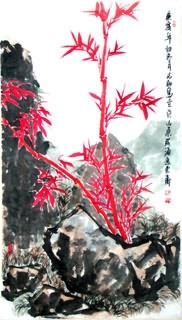 Chinese Bamboo and Peony Painting: 富贵平安. the meanning is clear: wealth, rank (the peony), and safety (the bamboo). 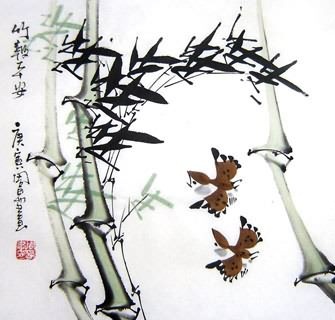 A Longevity Stone, Narcissus, and Bamboo Painting: 群仙祝寿. An arrangement consisting of a longevity stone, narcissus, and bamboo is a traditional birthday arrangement in Chinese floral art, the longevity stone (shoushi 寿石) rpresenting longevity and the bamboo (zhu 竹) homophonous with the zhu (祝) that means "wish." The Chinese name for narcissus (shuixian 水仙) means literally "water" (shui 水), "fairies" or "immortal beings" (xian 仙)，giving us the Immorta Beings subject. The whole arrangement convey the wish that may one's life as long as immortals. 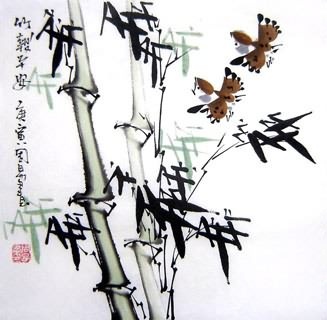 Bamboo Depicted with Other Two Auspicious Flowers or Plants Feng Shui Painting: Another lucky pattern. Making up the number three to convey the motif of more good fortune, more longevity, and more offsprings. InkDance Price: USD 485 /GBP 398 /EUR 461 Sold, you can customize it.